We all face the same mental countdown. Yet, how financially prepared are you to live the life you envision for you and your family? Most people are shocked to learn that retirement simply will not meet their expectations. Why? The answer is simple. Most financial planning methods fail. Unfortunately, their victims don't discover their shortcomings until it is too late. The result is an unsatisfying lifestyle during retirement or, worse, financial crisis. But you can ensure your financial security, as well as the lifestyle you crave. This book, Countdown, can be priceless. Why? Because it will change the way you look at financial planning. Plus it will arm you with the tools to meet your lifestyle goals. Good financial planning should be painless, automatic and positive. 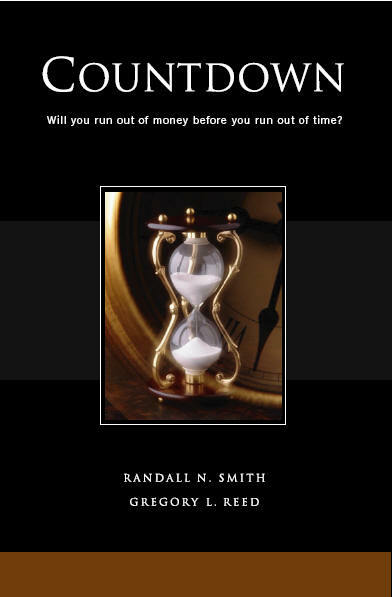 With this book, you can achieve a new vision of your financial future. Take control of your personal finances now. Securities and Investment Advisory Services are offered through Representatives of NFP Securities, Inc a Broker/Dealer, Member FINRA/SIPC and a Federally Registered Investment Advisor. Registered Representatives are licensed within the following states: AL, AR, AZ, CA, CO, GA, IL, KS, LA, MA, MN, NC, NJ, NY, OH, TX. Smith, Frank & Partners, LLC is an affiliate of NFP Securities, Inc. and a subsidiary of National Financial Partners Corp., the parent company of NFP Securities, Inc. This site is published for residents of the United States only. Registered representatives and investment advisor representatives of NFP Securities, Inc. may only conduct business with residents of the states and jurisdictions in which they are properly registered. Therefore, a response to a request for information may be delayed. Not all of the products and services referenced on this site are available in every state and through every representative or advisor listed. For additional information, please contact the NFP Securities, Inc. Compliance Department at 512-697-6000. NFP Securities, Inc does not give tax or legal advice. This site is published for residents of the United States only. Registered representatives and investment advisor representatives of NFP Securities, Inc. may only conduct business with residents of the states and jurisdictions in which they are properly registered. Therefore, a response to a request for information may be delayed. Not all of the products and services referenced on this site are available in every state and through every representative or advisor listed. For additional information, please contact the NFP Securities, Inc. Compliance Department at 512-697-6000.